The variety and quality of banner ads online is truly staggering. From the infamous X10 Camera pop-up, to Punch the Monkey, to today’s highly engaging rich media video ads, turning out great banner creative is a universal challenge. For nearly every facet of the creative process, there are libraries that can be used for inspiration. Font collection. Stock photography. Creative annuals. But until now, thinking through a banner ad design consisted of going to a few Web sites you like and hoping to find an ad that actually looked decent. 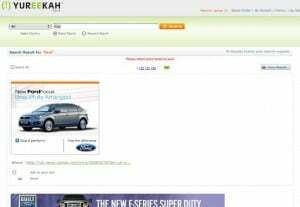 Yureekah is a free Web site that enables you to search banners ads by country (currently, U.S. U.K., India, and somewhat unexpectedly the United Arab Emirates), brand, or keyword. The site then returns a collection of banner ads matching your query, including where those ads are running. For example, a global brand search for “Ford” returns 31 results, including banners for at least 20 different campaigns. You can click a check box next to banners you particularly like and save them for future inspiration. – Competitor campaign monitoring. If you’re JCrew (if so, please send discount code) and you want to know what Eddie Bauer is doing with their online creative, type “eddie bauer” into Yureekah to find out. – Competitor media monitoring. Find our where Eddie Bauer is placing their online media. In fairness to Yureekah, the system is still in alpha (in fact you’ll need to request a log-in to get to the site). Consequently, we shouldn’t expect it to be perfect. However, there are definitely some gaps in the system. – The overall amount of ads in the search engine is pretty paltry. – The brand search is nearly useless. Except for Top 50 or so brands, don’t bother. Even my nifty Eddie Bauer example above came up with zero results. – Inability to search for ads by format. If I need to create a Leaderboard ad, it would be nice to only see Leaderboard-sized search results. – The email someone an ad system is very sketchy. It comes through as junk mail, and has no formatting or context at all. If it continues to evolve and expand, Yureekah could be a useful site for many in the agency community. However, their original alpha launch was in late April and no changes appear to have been made since then. Let’s hope it comes out of experimental phase and becomes the robust research tool it could be.